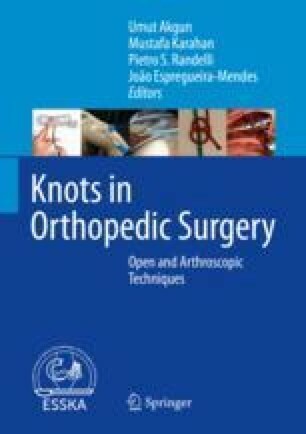 Technical advances in arthroscopic surgery have popularized the use of sliding knots in favor of traditional non-sliding or static knots. This preference may be a result of technical ease of tying through a cannula, as the surgeon can secure knots without switching post limbs. However, it has been shown that non-sliding knots such as the square or the Revo knot provide better loop and knot security. Furthermore, sliding knots cannot be used with suture anchors lacking an eyelet or in situations where it is difficult to slide sutures through soft tissue. Another indication for static knot tying is for repairs of degenerative soft tissue. In these cases, the suture may cause further damage to the tissue while advancing the knot. When performing a non-sliding knot, one has to take into consideration that the knot has to be seated properly before adding reversed half hitches to avoid premature knot locking resulting insufficient loop and knot security.